It was one of life’s spin ball moments. As I wandered through an exhibition at the city’s Supreme Court Museum that brought me closer than I had ever dreamt to my favourite revolutionary Bhagat Singh—his thoughts, his shirt, his books, his jail diary, his handwriting, his vital stats, the gifts he gave his friends—it came at my leg side from nowhere. I found myself staring at an uncovered copper urn with its contents clearly visible: I was looking at Bhagat Singh’s ashes. 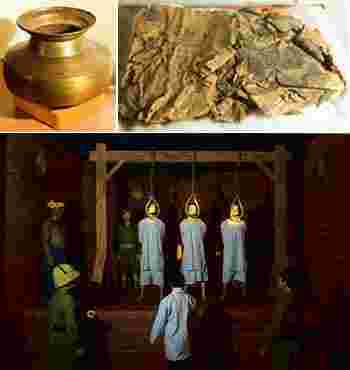 Historical accounts say that after they were hanged by the British in 1931, the bodies of Bhagat Singh, Rajguru and Sukhdev were cut into pieces and stuffed in sacks. They were sneaked out of Lahore Central Jail without the families’ knowledge and cremated on the banks of the Sutlej in Ferozepur, Punjab, before their remains were tossed into the river. Villagers fished out the improperly cremated bodies and completed the last rites. By the next day, it was a pilgrimage site; crowds picked up ashes, bloody stones, pieces of bone and whatever else they could find. Next to the copper container I couldn’t stop staring at are three glass jars with sand and pebbles “soaked in the blood of martyrs". There’s also a blood-soaked copy of The Tribune dated 25 March 1931, two days after Bhagat Singh was executed. This will sound weird, but suddenly, moving here from Mumbai almost seems worth it. The city of my birth may have launched the Quit India Movement, but there the only memory of Bhagat Singh is the main street we prefer to call Colaba Causeway. Bhagat Singh spent most of his short life in undivided Punjab and Kanpur but his dramatic Delhi connection is well-documented. Now, two exhibitions in the city are paying homage to the good-looking Sikh who believed he would have got the value of his life if he sacrificed it to spread the idea of Inquilab Zindabad to every corner of his country. Say Parliament bombing and most Delhiites will flashback to that televised terrorist attack on the sandstone building in 2001. But those two words were used in tandem several decades earlier, on 8 April 1929, when Bhagat Singh and Batukeshwar Dutt entered the visitors’ gallery of the same building and flung a low-intensity bomb into the assembly. “Inquilab Zindabad" and “Down with Imperialism", they shouted. They stood their ground until they were arrested. Incidentally, the term “revolutionary terrorism"—often used in descriptions of Bhagat Singh— originated in Maharashtra when the Chapekar brothers assassinated a couple of British officials in 1897. That day in Parliament, the two men didn’t want to kill anyone—they were protesting the anti-labour Bills that were due to be passed. By 1925, Bhagat Singh had shifted gears from romantic revolutionary to socialist revolutionary. In addition to freedom from the British, he wanted to liberate peasants and workers from their fellow Indians. A poignant jail register entry of Bhagat Singh’s arrest after the bombing notes that he was 21 years old, 5ft 9.5 inches, had a “very big scar about 2 inches square on the left leg lower part" and weighed 133lbs (around 60kg). His property is listed as, “shirt 1, necker 1, socks 1, belt 1". At the Nehru Memorial Museum and Library, the venue of the second exhibition, curator P. Chandramohan says only about four or five photographs of Bhagat Singh exist, including that famous one with the tilted hat, shot at a studio in Delhi’s Kashmere Gate locality, just three days before the Parliament blast. Chandramohan says a colleague of Bhagat Singh’s, who made the Parliament passes that fateful day, gave a copy of the photograph to The Hindustan Times newspaper and told them they would soon hear more about the man in the picture. Minutes later, the bomb went off in Parliament. This exhibition doesn’t have any thrilling artefacts (except a letter from Mahatma Gandhi to Batukeshwar Dutt) but it has the advantage of access to the library’s vast oral and written archives. At the Supreme Court museum, it took one year for the curators to collect the physical memories that remain. Curator Rajesh Prasad says they wrote to 60 individuals/institutions asking for help. The exhibits were finally sourced from the revolutionaries’ families, a science teacher, the national and Delhi archives, Dwarka Das Library, the Tribune Trust, and the Museum and Art Gallery in Chandigarh. Many of the exhibits, including the ashes, came from the Bhagat Singh museum in his ancestral village of Khatkar Kalan in Punjab. 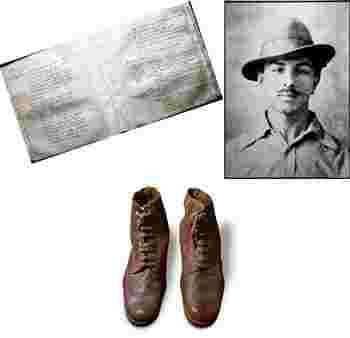 There’s Bhagat Singh’s tattered full-sleeve khaki shirt with the more pointy European collar marked “BS" on the inside, probably by the washerman, to identify its owner. The shirt has a little, inverted triangle tear on the left side of the upper torso and what look like splotches of blood on the right arm. In addition to documenting the making of a revolutionary, both shows throw up many personal insights. Bhagat Singh left home because he didn’t want to get married. “My life has already been committed to the noble cause… For that reason comforts and worldly desires have no attraction in my life… I hope you will excuse me," he wrote to his father. He also wrote Urdu poetry (alas, the curators say budget constraints didn’t allow them to hire a translator), loved movies and devoured Upton Sinclair. At least it seems that way from a list of books he read in jail—Boston, King Coal and The Jungle, all by Sinclair; Les Miserables by Victor Hugo and God and the State by Mikhail Bakunin (all on loan from the Dwarka Das Library, now located in Chandigarh, though Chandramohan says a part of the library’s collection shifted to Delhi’s Lajpat Bhavan). Best of all, Bhagat Singh wrote beautifully and in an exquisite slanting handwriting. His pet themes were conspiracies and bombings, the stories of individual revolutionaries and the need for young people to come forward and join the movement. How I wish I could run my hands over his jail diary, displayed in a glass case. That’s also where he wrote the book Why I Am an Atheist. Clearly he never suffered from writer’s block. As a prisoner, Bhagat Singh shot off frequent petitions. He sought a transfer to Lahore Central Jail from Mianwali Jail so he could engage a lawyer to fight the Lahore Conspiracy Case and prepare his defence. He said he was a political prisoner who deserved better treatment than an ordinary criminal. He demanded a special diet, no forced labour, toilet necessities and, of course, literature for reading. The Supreme Court Museum sourced copies of these petitions from a science professor in Ludhiana, who in turn got them from the Lahore court on a trip to Pakistan in the 1980s. When his father Kishan Singh pleaded that his son was innocent, the imprisoned revolutionary was enraged. “Had any other person done it, I would have considered it nothing short of treachery," he wrote. “Let me say father you have failed." He signed it, “Your loving son, Bhagat Singh".